Cornelius Heinrich Wedel: Mennonite (General Conference Mennonite Church) minister, educator, historian, and first president of Bethel College; born at Margenau, Molotschna Mennonite settlement, South Russia on 12 May 1860, the eldest son of Cornelius P. Wedel (14 August 1836, Waldheim, Molotschna, South Russia – 25 January 1900, Goessel, Kansas) and Helena (Wiebe) Wedel (2 September 1840, Margenau, Molotschna, South Russia – 28 March 1866, Alexanderwohl, Molotschna, South Russia). On 30 March 1891, he married Susanna Richert (20 March 1862, Gnadenheim, Molotschna, South Russia – 30 May 1916), the daughter of Heinrich Richert (1831-1895) and Anna (Schmidt) Richert (1827-1869) in Alexanderwohl, Kansas, USA. Cornelius and Susanna had three children: Theodor, Oswald, and Hilda. Wedel died 28 March 1910, and was buried in the Greenwood Cemetery, Newton, USA. Cornelius lost his mother at the age of six. His father taught first at Margenau, then at Alexanderwohl, where Cornelius received his first education. In 1874 the family migrated to the present Goessel, Kansas, with the Alexanderwohl group. In 1876-80 he taught school in this community. During some summers he attended schools in Marion Centre and in Hillsboro to learn English and to acquire a teacher's certificate. At the age of eighteen he was baptized on 4 August 1878 in the Alexanderwohl church where he organized and taught Sunday school and mission studies. In 1881 he received a call to the Darlington, Oklahoma mission. In 1882 he gave up the work because of eye trouble. In 1883 he attended McKendry College, Lebanon, Illinois, and the following years Bloomfield Theological Seminary, New Jersey, where he particularly studied under George Seibert and taught 1898-1900. Numerous class notebooks kept by Wedel give an insight into the instruction he received and into his studies. Here he was also in close touch with N. B. Grubb. In 1890 he accepted the call to the Halstead School, Halstead, Kansas, where he taught for three years. 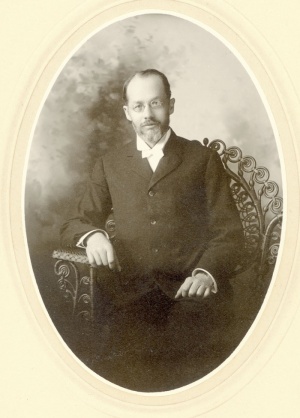 On 17 August 1890, he was ordained to the ministry in the Alexanderwohl Mennonite Church. He continued his study for two more years at Ursinus College, Collegeville, Pennsylvania, where he received his M.A. degree. In 1893 he became president of Bethel College and professor of Bible, which position he held until his death in 1910. In 1896 and 1898 Wedel made extensive trips to Germany, the Netherlands, Switzerland, and Russia for research in Mennonite history. His notebooks ("Reise nach Europa") and his printed reports give good insights as to what he looked for and what he found. He became a close friend of Samuel Cramer of Amsterdam and many other leading Mennonites. After his return he published "Aus der Reisemappe" and "Reiseskizzen und Randglossen," which were reports about his trip (School and College Journal, 1897 and 1899). In 1898 he published his first book, entitled Bilder aus der Kirchengeschichte für mennonitische Gemeindeschulen, which has been reprinted many times and also appeared in English in 1920 as "Sketches from Church History for Mennonite Schools." As an educator Wedel made an outstanding contribution among the Mennonites of America. He taught Bible, church history, Mennonite history, and German literature. The numerous notebooks that originated in his classrooms and have become a part of a C. H. Wedel Collection mirror his achievements. He was president of Bethel College 1893-1910 and served repeatedly at Bethel College Mennonite Church as pastor 1897-1910. In the Monatsblätter aus Bethel College, of which he was co-editor, and the School and College Journal, he published 182 articles on Mennonite history, literature, and other areas, besides his articles for other periodicals. A most outstanding work is the four-volume set, Abriss der Geschichte der Mennoniten (Newton, 1900-1904), which constitutes the first general and comprehensive history of the Mennonites written and published in America. Other books are as follows: Randzeichnungen zu den Geschichten des Alten Testaments (1899); Randzeichnungen zu den Geschichten des Neuen Testaments (1900); Geleitworte an junge Christen zunächst in unsern mennonitischen Kreisen (1903); Kurzgefasste Kirchengeschichte (1905); Briefliche Blätter an einen Lernenden über Bildung, Gesellschafts- und Heiratsfragen (1906); Meditationen zu den Fragen und Antworten unseres Katechismus (1910). All of these books except Meditationen were published by Bethel College. GRANDMA (The Genealogical Registry and Database of Mennonite Ancestry) Database, 5.03 ed. Fresno, CA: California Mennonite Historical Society, 2007: #81843. Juhnke, James C. Dialogue With a Heritage: Cornelius H. Wedel and the Beginning of Bethel College. North Newton, Kansas: Bethel College, 1987. Term papers by Richard Schmidt, John P. Loewen, and Dorothea Franzen. Voth, H. R. "Prof. C. H. Wedel." Christlicher Bundesbote (April 21 and 28, 1910): 5. Voth, H. R. "Prof. C. H. Wedel. Kurze Lebensskizze." Bethel College Monthly (May and June, 1910): 6 and 1. Wedel, C. H. "Mein Lebenslauf." 1881. Wedel, C. H. Tagebuch, 2 vols., 1885-1910. Wedel, C. H. "Reise nach Europa," 1898. Wedel, David C. "The Contribution of C. H. Wedel to the Mennonite Church Through Education." Th.D. dissertation, Iliff School of Theology, Denver, 1952. Wedel, Peter J. The Story of Bethel College. North Newton, 1954. Krahn, Cornelius and Richard D. Thiessen. "Wedel, Cornelius Heinrich (1860-1910)." Global Anabaptist Mennonite Encyclopedia Online. August 2007. Web. 21 Apr 2019. http://gameo.org/index.php?title=Wedel,_Cornelius_Heinrich_(1860-1910)&oldid=112052. Krahn, Cornelius and Richard D. Thiessen. (August 2007). Wedel, Cornelius Heinrich (1860-1910). Global Anabaptist Mennonite Encyclopedia Online. Retrieved 21 April 2019, from http://gameo.org/index.php?title=Wedel,_Cornelius_Heinrich_(1860-1910)&oldid=112052. Adapted by permission of Herald Press, Harrisonburg, Virginia, from Mennonite Encyclopedia, Vol. 4, pp. 907-908. All rights reserved. This page was last modified on 23 January 2014, at 20:06.